When Anh of A Food Lover's Journey announces a monthly blog-event Delicious Vietnam for us to express our love, passion, knowledge or even curiosity to Vietnamese cuisine, I jump to join right away without hesitation! Even I am not Vietnamese, haven't been to the country, nor have much chance to taste many of their dishes, but just looking at what this cuisine always emphasizes: freshness of ingredients and eating a lot of vegetable, aren't they ones of the essential steps we love to follow in order to pursuit a healthy eating style? 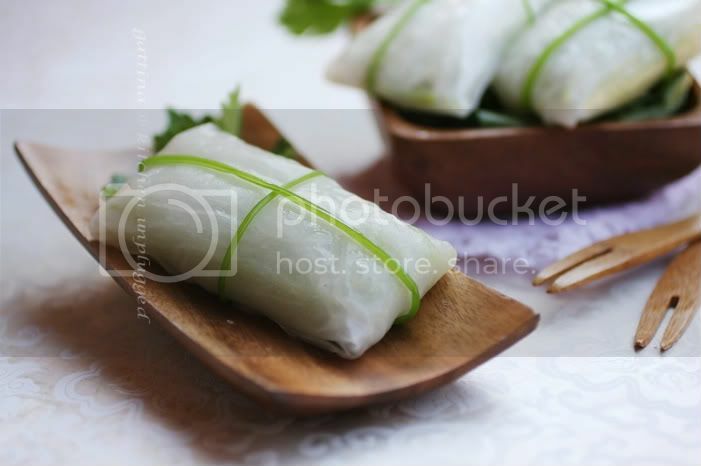 Besides, some of their ingredients are readily available overseas (like the rice roll paper I am using), so come and try your hand at cooking Vietnamese food! These vegetable roll-ups are always a crowd-pleaser in my parties as they are healthy, delicious, great for picking and munching (those lettuce leaves never cooperate with my fork...). Besides, the rolls can be made ahead so that you won't be still slaving yourself in kitchen during the party. So I decide to send the recipe to Delicious Vietnam in May. 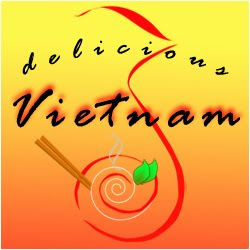 Anh of A Food Lover's Journey and Hong & Kim of Ravenous Couple are the founders of Delicious Vietnam. The May's DV Anh is our host, so please send your entry to her, the deadline is May 10 (Melbourne time). I particularly chose a certain type of veg as its texture remains toothsome after cooking/steaming. Steaming at the end is sort of like re-heating, but I also find the flavor of the rice roll taste much better in this way. Pre-heat a skillet with a bit oil, saute the onion over very low heat for 2 minutes. Then add garlic, celery, carrot and cloud ear fungus (no need to cook cucumber and agar-agar), chicken powder, pepper and salt to taste, saute for a minute or 2 (don't be too long). Scoop them on a plate and let cool completely. Then combine with agar-agar and cucumber. Set aside. Lightly grease your work table ready for rolling. 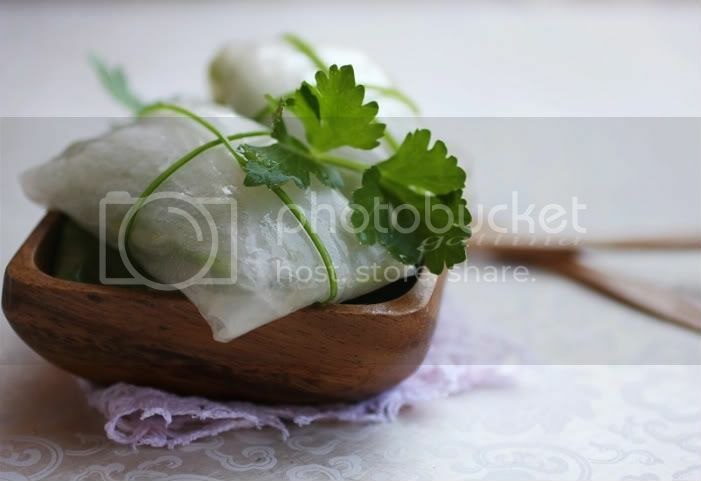 Fill a tray with tap water, dip in a piece of rice paper. When you see it just start turning soft (my case only take 30 seconds), remove it and lay it on the table. Arrange the veg in the centre, fold up the two sides then roll up from top to bottom. Repeat to the other 5 rolls. Place the roll-ups on a pre-greased plate. If you are not going to steam the rolls right away, wrap the plate with plastic wrap and store in the fridge (up to a half day). To steam the rolls: fill a large pot with water, about 5 cm deep, bring the water to boil. Place a steel rack in and sit the plate on. Lid on and steam for about 2 minutes (not need to be long). Serve immediately. this is like a lovely little present..waiting to be devoured! great entry! Gattina, I am excited to see your savory dishes. As always they are like poetry, neat and compact. Will look up the event, love Vietnamese food. That looks so good! I love that it looks like a present. As always, your photos make me want to reach right into my computer screen for one of those vegetable rolls! Gattina, thanks buddy for joining this evene! *hugs* I'm still eating pizza *LOL* Need to get my act together and eat some healthier stuff. must try teh steaming part,usually we eat them raw, our fridge is packed with rice paper so yr recipe comes very handy thank u! I've tried using rice paper a few times - I didn't really like ther results. I think steaming for a few minutes will make them much better. Thanks for the tip. And here in France, Vietnamese is a bit easier to find. G, I just realised that you have two blogs. Amazing power you have. Hubby will be visiting Spain more often and am wondering what is good there that Singapore don't have. This is not the first time I have seen vegetable Roll but this one is the most cute and pretty one. Love it. Looks so good. Love it. I can eat this everyday! When I think of Vietnamese food, I think of spring rolls! Great click! HOw pretty and neat! Cute little parcel of goodness.